Real Love Tastes Like This… yes, indeed it does. The pleasantries contained within young Norwegian aficionado Mathias Stubo’s debut are so overwhelming it’s difficult to imagine anyone not falling devastatingly head over heels for the soundtrack it provides. Which leaves just one question: who remembers when this kind of music was (relatively) commonplace? Because it kind of was. Then as the new millennium gained pace people seemed to forget about the hip-hop breaks that soundtrack barbecues so perfectly. Likewise, the marriage of live instrumentation and house sensibilities Jazzanova popularised no longer has countless producers paying homage. Though to open an overview of an album truly worth its weight in gold by harping on about the glory days of broken funk seems disrespectful. 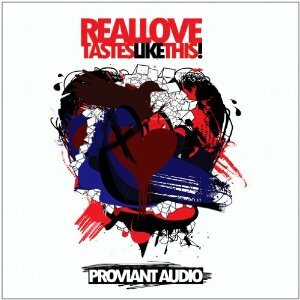 After all, Proviant Audio is a name set to make a significant impact as the future of breaks, disco, downtempo four fours and electric funk unfolds. It’s a statement confirmed two-minutes and 57 seconds through In The Jungle, when horns, trumpets, triangles and claps come together in one massive hands in the air moment. If we weren’t more cautious, the term life-affirming could almost slip out, despite the fact said track’s opening is more in line with Lemon Jelly’s cartoon-like chill out, than anything truly emotive (coming complete with a sample explaining how to handle rodents). Still, serious or not, everything about it is infinitely listenable. As is High Five, a rolling disco number made from scatty percussion, whistles and funk licks, punctuated with tom rolls and synths straight from the 70s, where the brass section can also be found. Yet, despite such classical muses, the production quality, and contemporary innovation never drops off. Just listen to the way we saunter off towards the conclusion through a sunsoaked haze, after dropping the tempo down. Slutten Pa Alt appears, on first contact, to be constructed from the same sources, until the mechanical groove comes to the fore. Accents within the proceeding tunes left little guesswork as to when they were made, but here the signs aren’t subtle so much as sewn onto the sleeve. And that’s even with the staccato live snares and near freeform piano touches, because there’s also a breakdown of distorted and looped pipes, complete with off-beat organ stabs that drops midway, nodding to today’s post-ravers. Such compositions and arrangements are equal in intelligent design to any celebrated alternative fare. But in this case the results make for a sound that’s universally accessible, as closer Is It Over proves with its shrill female vocals, string hooks, snaps of ivory, and 1940s French cafe stylings. Petering out into a blissful chillout score boasting an ocean view, the final moments confirm that whatever musical rhetoric begins after hearing this staggering collection, the best thing about it is the smile you’ll be wearing throughout.